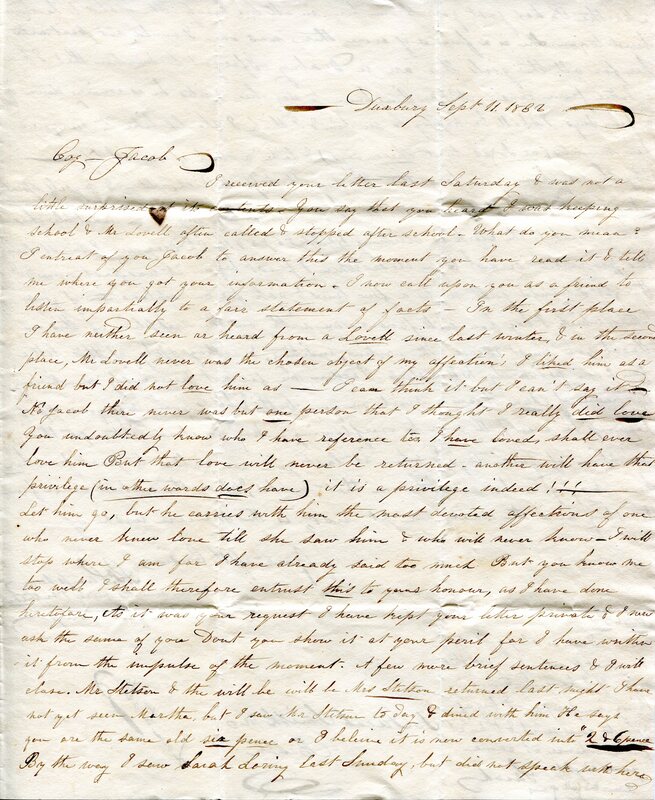 At 9pm on the night of September 11, 1836, Sarah F. Sampson sat in her bedroom and wrote one last love letter to her cousin Jacob Smith, Jr. It was Jacob’s 25th birthday but she did not mention the occasion in her letter, perhaps she had forgotten. What she did mention, repeatedly, was her devotion to him. This could not have been an easy thing to write, as Jacob was due to marry Persis “Ann” Weston, another cousin, in less than a month. At no point did Sarah implore Jacob not to marry, she even wished him well, but it is clear she would rather he had chosen her. Sarah Freeman Sampson was born in Duxbury on March 1, 1813 in the cape-style home her father, Martin Sampson, had built in 1807 (today’s 57 South Station Ave.). Sarah’s mother died within months of her birth, leaving her father to care for her as well as her two siblings, ages 3 and 5. Not surprisingly, Martin chose to remarry rather quickly, and it was through Martin Sampson’s second wife, Sarah Smith, that Sarah F. would become related to the recipient of her letter. Jacob Smith, Jr. was Sarah Smith’s nephew. Not that their paths wouldn’t have crossed without this connection – Sarah’s house was only a stone’s throw to Jacob’s, he living at what is today 251 Harrison Street. But, the inevitable family gatherings must have made the two much more aware of each other. And young Jacob Smith was certainly someone to notice. By 1836 he was already first mate on his father’s brig, Globe. He had gone to sea when he was only eight, celebrating his ninth birthday in Malaga, Spain. According to one source, at age eleven he had been paraded in front of Russian nobility in St. Petersburg as the first American child they had ever seen. While many Duxbury sailors could tell tales of far away places to impress the ladies, Jacob had the advantage of being young, wealthy and having great prospects. His father, Capt. Jacob Smith, Sr., was an important member of the town who not only owned a number of Duxbury properties, but also a large farm in Marshfield. Is it any wonder that Sarah F.Sampson was smitten? How Jacob received his cousin’s letter, or whether he returned her sentiments, is impossible to know. Sarah’s letter does indicate she had received an equally private one from him so there may have been complicated feelings on both sides. Regardless, he went ahead with his wedding to Persis Ann Weston in October, 1836. Persis, or Ann, as she was called, was the niece of his step-mother (like Sarah Sampson, Jacob had lost his own mother when he was very young). Married life did not keep him at home, at least not initially. As the captain of his own vessel, Jacob traveled around Cape Horn and up the western seaboard in 1837, trading with the natives for sable furs which he sold back in New England. In 1838 he was in London to see the coronation of Queen Victoria. At the age of thirty, having been aboard a ship more often than not, he retired from the sea and moved to Westford, MA. There he owned an historic tavern, became a gentleman farmer and was active in local politics – he served as a Selectman during all four years of the Civil War. He died in 1898, the oldest man in Westford at the time, leaving behind his wife, Ann, and two daughters – Miss Clara A. Smith and Mrs. Louisa D. Young. A son, Henry, had died in a tragic rail road accident at the age of 21 in 1863. Lest you feel too badly for Sarah F. Sampson, let me assure you she married well and had a happy life (or as happy as we can surmise from the scant information left to us). In 1840 her heart was mended enough to accept the proposal of a very successful dry goods merchant from Medford named Jonas Coburn. Together they had five children: Sarah Louise (b. 1841), Charles F. (b. 1843), George M. (b. 1846), Frank (b. 1853) and William (b. 1854). All lived to adulthood but William who died at age 4. The Coburns were very active in civic affairs and were substantial members of the community. As a memorial to their parents, the children of Jonas and Sarah had a stained glass window installed in the First Parish Church in Medford that can still be seen today. During the summer months Sarah would bring her family to Duxbury and stay with her unmarried sister, Hannah, in her childhood home. After Hannah Sampson’s death in 1882, the house was left to Sarah and her children who retained the property as a summer residence into the 20th century. Sarah Freeman Sampson Coburn died in Medford, MA in 1890, at age 77. I am so sleepy that I cannot possibly read this over. If I have written anything improper I beg of you to excuse it & take it from whence it came. Note: Mr. Lovell is a mystery at this time but some of the other names a known. Mr. and Mrs. Stetson are Jacob Smith’s brother-in-law, Samuel Stetson, and sister, Martha. Samuel Stetson was a lawyer and the couple lived on Tremont Street. G. M. Richardson was most likely part of the Richardson family that owned a large estate adjacent to Sarah F. Sampson’s house. The estate was once owned by George Partridge, one of Duxbury’s most prominent citizens and inherited by George P. Richardson. Martha R may be Martha Richardson (b. 1815). N.F. Frothingham is Nathaniel F. Frothingham of Charlestown, MA whose mother was Joanna Sampson of Duxbury. He married Margaret T. Smith, the daughter of Capt. Benjamin Smith and cousin to both Jacob Smith, Jr and Sarah F. Sampson. 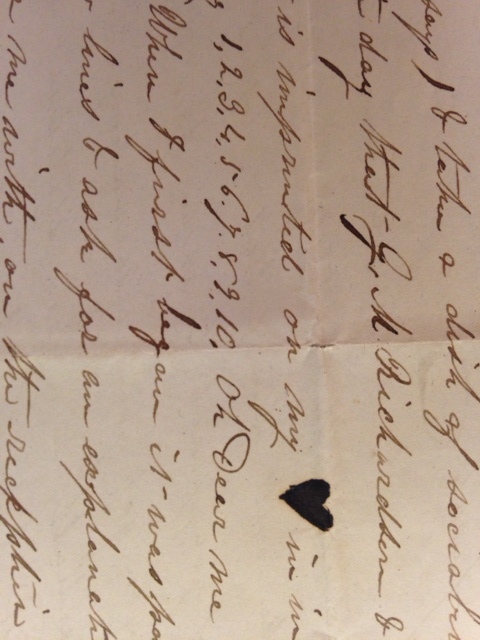 It is interesting to note that Frothingham married Margaret on Sept. 30, 1836, just 19 days after this letter was written.